The Lochside Trail is a picturesque multi–use trail, formerly a railway line, that stretches from Swartz Bay to Victoria, past beaches, farmland, and wetlands, down country lanes and beside suburban backyards. While some parts of the Lochside Trail are off-road and others downright pastoral, in some places trail visitors must share paved or gravel public roads with motor vehicles and farm vehicles. 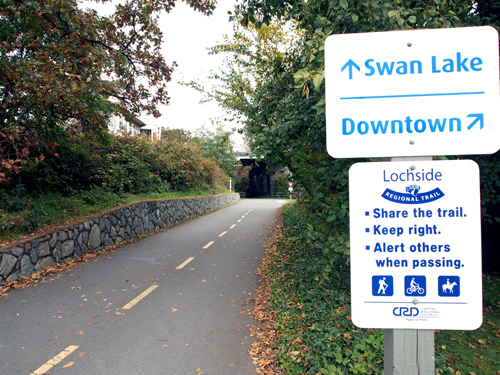 The Lochside Trail is 29km long and it runs through Saanich, Central Saanich, Sidney, and North Saanich. The CRD has rated this trail as Accessible (paved sections) to Easy The Lochside Trail intersects with the Galloping Goose Regional Trail, a 55 kilometre former railway line from Victoria to Sooke, and the first section of the Trans-Canada Trail. This regional parks and trails map shows the Lochside trail and all the accessible parks along the way. Check out the CRD website for suggested cycle day trips and more about the Lochside Regional Trail.